Jack Marriott scores for Posh against Tranmere in the FA Cup. The power of positive thinking will keep Peterborough United in the League One promotion picture according to top scorer Jack Marriott. 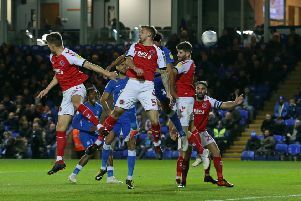 Posh managed to arrest a slide down the table with a battling 1-0 win over leaders Shrewsbury in their last League outing, but they remain ninth ahead of Sunday’s live televised game at Wimbledon. Danny Lloyd is set to start at Wimbledon. Marriott will be a key man in that game as he is shouldering the responsibility for scoring the goals for Posh. The 23 year-old has 12 in 20 appearances, more than double the next highest scorer. His goal in the Checkatrade Trophy win at Cambridge on Tuesday was a sixth in his last 10 appearances. But Marriott believes the team spirit and the fan power evident in a 2-0 success at Cambridge will keep Posh in touch with the rest of the promotion-chasing pack. “We are all playing for each other, for the manager and for the fans,” Marriott stated. “We have a great team spirit here. We wind each other up with great banter every day. “We also have a good laugh every day because we all get on so well, but the manager keeps our minds on the job. Successful teams don’t get carried away with a win or a defeat. “We are a positive group and that can only help us as the season develops and we are in a decent position for the beginning of November anyway. “It’s time for us to really knuckle down now though. It was a big win for us at Cambridge because we needed the performance and the result after not playing so well in the FA Cup tie last weekend. “It was a great result and I was delighted to score again, especially in front of so many of our own fans. How good were they by the way? To take so many (over 1,100 travelled) on a west Tuesday night was impressive. Marriott is likely to have summer signing Danny Lloyd as a strike partner for the game at Wimbledon. The 25 year-old has yet to start a League One match, but impressed manager Grant McCann with his performance at Cambridge. Posh chairman Darragh MacAnthony is also a Lloyd fan. “Danny did well at Cambridge,” McAnthony stated. “He has pace, a good work ethic and an eye for goal as he showed last season when scoring 29 goals last year playing off a striker. Lloyd moved to Posh from non-league Stockport in the summer.